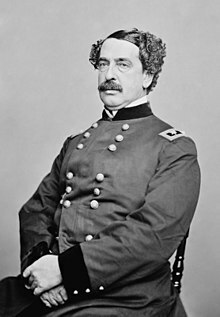 Abner Doubleday (June 26, 1819 – January 26, 1893) was a career United States Army officer and Union major general in the American Civil War. He fired the first shot in defense of Fort Sumter, the opening battle of the war, and had a pivotal role in the early fighting at the Battle of Gettysburg. Gettysburg was his finest hour, but his relief by Maj. Gen. George G. Meade caused lasting enmity between the two men. In San Francisco, after the war, he obtained a patent on the cable car railway that still runs there. In his final years in New Jersey, he was a prominent member and later president of the Theosophical Society. In 1908, fifteen years after his death, Doubleday was declared by the Mills Commission to have invented the game of baseball (a claim never made by Doubleday during his lifetime). This claim has been thoroughly debunked by baseball historians. Doubleday, the son of Ulysses F. Doubleday and Hester Donnelly, was born in Ballston Spa, New York, in a small house on the corner of Washington and Fenwick streets. As a child, Abner was very short. The family all slept in the attic loft of the one-room house. His paternal grandfather, also named Abner, had fought in the American Revolutionary War. His maternal grandfather Thomas Donnelly joined the army at 14 and was a mounted messenger for George Washington. His great grandfather Peter Donnelly was a Minuteman. His father, Ulysses F., fought in the War of 1812, published newspapers and books, and represented Auburn, New York for four years in the United States Congress. Abner spent his childhood in Auburn and later was sent to Cooperstown to live with his uncle and attend a private preparatory high school. He practiced as a surveyor and civil engineer for two years before entering the United States Military Academy in 1838. He graduated in 1842, 24th in a class of 56 cadets, and was commissioned a brevet second lieutenant in the 3rd U.S. Artillery. In 1852, he married Mary Hewitt of Baltimore, the daughter of a local lawyer. Doubleday initially served in coastal garrisons and then in the Mexican–American War from 1846 to 1848 and the Seminole Wars from 1856 to 1858. In 1858 he was transferred to Fort Moultrie in Charleston Harbor serving under Colonel John L. Gardner. By the start of the Civil War, he was a captain and second in command in the garrison at Fort Sumter, under Major Robert Anderson. He aimed the cannon that fired the first return shot in answer to the Confederate bombardment on April 12, 1861. He subsequently referred to himself as the "hero of Sumter" for this role. Doubleday was promoted to major on May 14, 1861, and commanded the Artillery Department in the Shenandoah Valley from June to August, and then the artillery for Major General Nathaniel Banks's division of the Army of the Potomac. He was appointed brigadier general of volunteers on February 3, 1862, and was assigned to duty in northern Virginia while the Army of the Potomac conducted the Peninsula Campaign. His first combat assignment was to lead the 2nd Brigade, 1st Division, III Corps of the Army of Virginia during the Northern Virginia Campaign. In the actions at Brawner's farm, just before the Second Battle of Bull Run, he took the initiative to send two of his regiments to reinforce Brigadier General John Gibbon's brigade against a larger Confederate force, fighting it to a standstill. (Personal initiative was required since his division commander, Brig. Gen. Rufus King, was incapacitated by an epileptic seizure at the time. He was replaced by Brigadier General John P. Hatch.) His men were routed when they encountered Major General James Longstreet's corps, but by the following day, August 30, he took command of the division when Hatch was wounded, and he led his men to cover the retreat of the Union Army. Doubleday again led the division, now assigned to the I Corps of the Army of the Potomac, after South Mountain, where Hatch was wounded again. At Antietam, he led his men into the deadly fighting in the Cornfield and the West Woods, and one colonel described him as a "gallant officer ... remarkably cool and at the very front of battle." He was wounded when an artillery shell exploded near his horse, throwing him to the ground in a violent fall. He received a brevet promotion to lieutenant colonel in the regular army for his actions at Antietam and was promoted in March 1863 to major general of volunteers, to rank from November 29, 1862. At Fredericksburg in December 1862, his division mostly sat idle. During the winter, the I Corps was reorganized and Doubleday assumed command of the 3rd Division. At Chancellorsville in May 1863, the division was kept in reserve. At the start of the Battle of Gettysburg, July 1, 1863, Doubleday's division was the second infantry division on the field to reinforce the cavalry division of Brigadier General John Buford. When his corps commander, Major General John F. Reynolds, was killed very early in the fighting, Doubleday found himself in command of the corps at 10:50 am. His men fought well in the morning, putting up a stout resistance, but as overwhelming Confederate forces massed against them, their line eventually broke and they retreated back through the town of Gettysburg to the relative safety of Cemetery Hill south of town. It was Doubleday's finest performance during the war, five hours leading 9,500 men against ten Confederate brigades that numbered more than 16,000. Seven of those brigades sustained casualties that ranged from 35 to 50 percent, indicating the ferocity of the Union defense. On Cemetery Hill, however, the I Corps could muster only a third of its men as effective for duty, and the corps was essentially destroyed as a combat force for the rest of the battle; it would be decommissioned in March 1864, its surviving units consolidated into other corps. On July 2, 1863, Army of the Potomac commander Maj. Gen. George G. Meade replaced Doubleday with Major General John Newton, a more junior officer from another corps. The ostensible reason was a false report by XI Corps commander Major General Oliver O. Howard that Doubleday's corps broke first, causing the entire Union line to collapse, but Meade also had a long history of disdain for Doubleday's combat effectiveness, dating back to South Mountain. Doubleday was humiliated by this snub and held a lasting grudge against Meade, but he returned to division command and fought well for the remainder of the battle. He was wounded in the neck on the second day of Gettysburg and received a brevet promotion to colonel in the regular army for his service. He formally requested reinstatement as I Corps commander, but Meade refused, and Doubleday left Gettysburg on July 7 for Washington. Doubleday's indecision as a commander in the war resulted in his uncomplimentary nickname "Forty-Eight Hours." Doubleday assumed administrative duties in the defenses of Washington, D.C., where he was in charge of courts martial, which gave him legal experience that he used after the war. His only return to combat was directing a portion of the defenses against the attack by Confederate Lieutenant General Jubal A. Early in the Valley Campaigns of 1864. Also while in Washington, Doubleday testified against George Meade at the United States Congress Joint Committee on the Conduct of the War, criticizing him harshly over his conduct of the Battle of Gettysburg. While in Washington, Doubleday remained a loyal Republican and staunch supporter of President Abraham Lincoln. Doubleday rode with Lincoln on the train to Gettysburg for the Gettysburg Address and Col. and Mrs. Doubleday attended events with Mr. and Mrs. Lincoln in Washington. In the 1870s, he was listed in the New York business directory as lawyer. Doubleday spent much of his time writing. He published two important works on the Civil War: Reminiscences of Forts Sumter and Moultrie (1876), and Chancellorsville and Gettysburg (1882), the latter being a volume of the series Campaigns of the Civil War. In the summer of 1878, Doubleday lived in Mendham Township, New Jersey, and became a prominent member of the Theosophical Society. When two of the founders of that society, Helena Blavatsky and Henry Steel Olcott, moved to India at the end of that year, he was constituted as the president of the American body. Another prominent member was Thomas A. Edison. Doubleday died of heart disease in 1893. Doubleday's body was laid in state in New York's City Hall and then was taken to Washington by train from Mendham Township, and is buried in Arlington National Cemetery in Arlington, Virginia. Although Doubleday achieved minor fame as a competent combat general with experience in many important Civil War battles, he is more widely known as the supposed inventor of the game of baseball, in Elihu Phinney's cow pasture in Cooperstown, New York, in 1839. The Mills Commission, chaired by Abraham G. Mills, the fourth president of the National League, was appointed in 1905 to determine the origin of baseball. The committee's final report, on December 30, 1907, stated, in part, that "the first scheme for playing baseball, according to the best evidence obtainable to date, was devised by Abner Doubleday at Cooperstown, New York, in 1839." It concluded by saying, "in the years to come, in the view of the hundreds of thousands of people who are devoted to baseball, and the millions who will be, Abner Doubleday's fame will rest evenly, if not quite as much, upon the fact that he was its inventor ... as upon his brilliant and distinguished career as an officer in the Federal Army." However, there is considerable evidence to dispute this claim. Baseball historian George B. Kirsch has described the results of the Mills Commission as a "myth". He wrote, "Robert Henderson, Harold Seymour, and other scholars have since debunked the Doubleday-Cooperstown myth, which nonetheless remains powerful in the American imagination because of the efforts of Major League Baseball and the Hall of Fame in Cooperstown." At his death, Doubleday left many letters and papers, none of which describe baseball or give any suggestion that he considered himself a prominent person in the evolution of the game, and his New York Times obituary did not mention the game at all. Chairman Mills himself, who had been a Civil War colleague of Doubleday and a member of the honor guard for Doubleday's body as it lay in state in New York City, never recalled hearing Doubleday describe his role as the inventor. Doubleday was a cadet at West Point in the year of the alleged invention and his family had moved away from Cooperstown the prior year. Furthermore, the primary testimony to the commission that connected baseball to Doubleday was that of Abner Graves, whose credibility is questionable; a few years later, he shot his wife to death and was committed to an institution for the criminally insane for the rest of his life. Part of the confusion could stem from there being another man by the same name in Cooperstown in 1839. Despite the lack of solid evidence linking Doubleday to the origins of baseball, Cooperstown, New York, became the new home of what is today the National Baseball Hall of Fame and Museum in 1937. There may have been some relationship to baseball as a national sport and Abner Doubleday. While the modern rules of baseball were formulated in New York during the 1840s, it was the scattering of New Yorkers exposed to these rules throughout the country, that spread not only baseball, but also the "New York Rules", thereby harmonizing the rules, and being a catalyst for its growth. Doubleday was a high-ranking officer, whose duties included seeing to provisions for the US Army fighting throughout the south and border states. For the morale of the men, he is said to have provisioned balls and bats for the men. There is a monument to Doubleday at Gettysburg erected by his men, admirers, and the state of New York. There is a 7-foot (2.1 m) obelisk monument at Arlington National Cemetery where he is buried, located about 130 feet (40 m) behind the Lee Mansion. There was a movement to petition the postmaster general to issue a U.S. postage stamp for him in 2011, commemorating the 150th anniversary of Fort Sumter. Doubleday Field is a minor league baseball stadium named for Abner Doubleday, located in Cooperstown, New York, near the Baseball Hall of Fame. It hosted the annual Hall of Fame Game, an exhibition game between two major league teams that was played from 1940 until 2008. The Auburn Doubledays are a minor league baseball team based in Doubleday's hometown of Auburn, New York. Doubleday Field at the United States Military Academy at West Point, New York, where the Army Black Knights play at Johnson Stadium, is named in Doubleday's honor. The Abner Doubleday Little League and Babe Ruth Fields in Ballston Spa, New York, the town of his birth. The house of his birth still stands in the middle of town and there is a monument to him on Front Street. A sign at the Doubleday Hill Monument, erected in Williamsport, Maryland to commemorate Doubleday's occupation of a hill there during the Civil War, claims he invented the game in 1835. Mendham Borough, New Jersey and Mendham Township, New Jersey held a municipal holiday known as "Abner Doubleday Day" for numerous years in the General's honor and commissioned a plaque near the sight of his home in the borough in 1998, even though the borough was known as Mendham Township back then. In 2004 the Abner Doubleday Society erected a monument to Doubleday in Iron Spring Park, Ballston Spa, near his birthplace. In World War II, the United States liberty ship SS Abner Doubleday was named in his honor. In the movie The Ridiculous 6, Doubleday is portrayed by John Turturro. The character organizes the first game of baseball between the six main characters and a group of Chinese immigrants, creating the rules as he goes, primarily to allow him to win. In the 23rd episode of the anime Samurai Champloo, titled "Baseball Blues", Doubleday and Alexander Cartwright are featured as American naval officers who engage the main characters and local Japanese people into a baseball game, which the Americans lose. Wikisource has the text of the 1911 Encyclopædia Britannica article Doubleday, Abner. ^ a b Kirsch, pp. xiii-xiv. ^ "The Doubleday myth is Cooperstown's gain: Pastoral village has become the heart of baseball folklore". National Baseball Hall of Fame and Museum. Archived from the original on September 26, 2014. Retrieved September 20, 2012. ^ a b c Beckenbaugh, pp. 611-12. ^ a b c d e f g h Tagg, pp. 25-27. ^ a b c d e Eicher, p. 213. ^ Langellier, pp. 43, 45, 49. ^ "Hall of Fame schedules replacement game for 2009". USA Today. November 18, 2008. Coddington, Edwin B. (1968). The Gettysburg Campaign: A Study in Command. New York: Simon & Schuster. Doubleday, Abner (1998). My Life in the Old Army: The Reminiscences of Abner Doubleday. Fort Worth: Texas Christian University Press. ISBN 978-0-87565-185-9. Gomes, Michael. "Abner Doubleday and Theosophy in America: 1879-1884". Sunrise, April/May 1991. Heidler, David Stephen; Heidler, Jeanne T.; Coles, David J. (2000). Encyclopedia of the American Civil War: A Political, Social, and Military History. Santa Barbara, California: ABC-CLIO. ISBN 978-0-393-04758-5. Kirsch, George B. (2002). Baseball in Blue and Gray: The National Pastime During the Civil War. Princeton, N.J.: Princeton University Press. ISBN 978-0-691-05733-0. Langellier, John P. (2002). Second Manassas 1862: Robert E. Lee's Greatest Victory. Oxford, Eng. : Osprey Military. ISBN 978-1-84176-230-2. Tagg, Larry (1998). The Generals of Gettysburg: The Leaders of America's Greatest Battle. Campbell, California: Savas Publishing Company. ISBN 978-1-882810-30-7. Archived from the original on October 22, 2014. "Doubleday, Abner" in The Handbook of Texas. Doubleday, Abner (1882). Chancellorsville and Gettysburg. New York: C. Scribner's Sons. Doubleday, Abner (1998). Reminiscences of Forts Sumter and Moultrie in 1860-61. Charleston, South Carolina: Nautical & Aviation Publishing Company. ISBN 1-877853-40-2. Hyde, Bill (2003). The Union Generals Speak: The Meade Hearings on the Battle of Gettysburg. Baton Rouge, La. : Louisiana State University Press. ISBN 978-0-8071-2581-6. Wikimedia Commons has media related to Abner Doubleday.